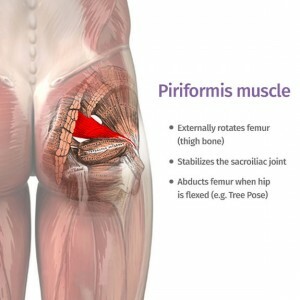 What is Piriformis Syndrome ? Piriformis syndrome is an uncommon neuromuscular disorder that is caused when the piriformis muscle compresses the sciatic nerve. The piriformis muscle is a flat, band-like muscle located in the buttocks near the top of the hip joint. This muscle is important in lower body movement because it stabilizes the hip joint and lifts and rotates the thigh away from the body. This enables us to walk, shift our weight from one foot to another, and maintain balance. It is also used in sports that involve lifting and rotating the thighs — in short, in almost every motion of the hips and legs.